If you are interested in knowing about the current situation about the iPhone 4 baseband 4.11.08 and 4.12.01 unlock, then you have come to the right post. People who were able to get the iPhone 4 5.1.1 unlock should have kept their unlock activation tickets. There SAM unlock activation ticket allow you to keep your iPhone 4 unlocked. Creating a custom firmware can allow users to go to the iOS 5.1.1 and keep their device unlock and the baseband won't be upgraded. However, the iOS 5.1.1 can only be jailbroken tethered — that's why it's risky! It claimed to unlock the iPhone 4 on the basebands 4.11.08 and 4.12.01. However, it was discovered that it was a fake, and it could also have been a copy of the SAM unlock tool. Your contract time with AT&T needs to be over. Secondly, for those who have purchased from someone else and the customer has paid a beginning termination feeds, in that case your eligible. The most crucial is that you must be active AT&T customer. If you have iPhone purchased from eBay, Amazon or etc., You are in a hopeless situation. Intel 36MY1EF 128MB NOR chip which costs US$67.00. Infineon Baseband Chip X618 (pre-programmed) baseband 1.59.00 which costs US$88.00. Worldwide standard shipping (can be tracked online and will take up to 20 days) which is free. Labor charge which costs $24.00. This is going to work but the main issue the workers at beijingiphonerepair face is sourcing those rare 1.59.00 baseband chips. The IMEI serial number change will be caused by the change of the chip so the unlocked iPhone can be activated using any hackivated custom firmware and latest ultrasn0w. There will be no issue in the process of restoration to stock firmware. We know the method is hectic. But this hardware hack to downgrade iPhone 4 baseband 4.12.01 / 4.11.08 to 01.59.00 is reliable and can allow you to unlock iPhone using ultrasn0w. Unlock ANY ATT iPhone 4S, 4, 3Gs & 3G on iOS 5.1.1, 5.1, 5.0.1, 5.0 & 4.2.1. Yes this is Permanent and cannot be removed, EVER. It will work on any Blacklisted, Bad ESN or “Gulp” Stolen iPhone. This is by far the best unlock ever made and completely worth the 16 – 20 dollar price on eBay Make sure you read the review before buy it . Yes it will work on any New Baseband chip 3Gs as well so everybody is covered! No however the Sprint & Verizon 4S are not supported and the iPhone 4 CDMA is clearly not supported as well due to its lack of a sim card slot. NOTICE! : If your iPhone is originally from Telus, Koodo, Telenor, Orange, Movistar, Rogers or O2 then you need to ebay search “Your Carrier iPhone Factory Unlock”. There is a different unlock version for that device. It will cost more though.. If you keep being redirected to the Activation screen then simply Turn Auto Carrier Selection “Off” in the “Carrier” tab every time it appears. This will fix the problem. 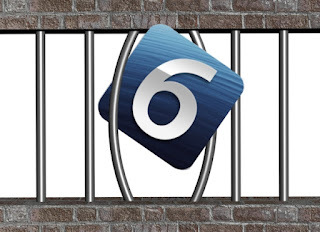 Apple recently released iOS 6 (6.0) to the public and, after much debate, I’ve decided to create this tutorial on how to Jailbreak the public version of iOS 6. Initially, I was planning on waiting until the iPhone Dev Team updated Redsn0w before I released a tutorial. However, since they haven’t, and due to the overwhelming number of questions pertaining to this Jailbreak, I decided to slightly revise my iOS 6 Jailbreak tutorial plans. Before it has even been released we now face a Temporary Jailbreak for the iPhone 4, 3Gs & iPod Touch 4G on iOS 6.0 GM Firmware. This Jailbreak however is tethered meaning it is not capable of rebooting on its own without the help of a Program called redsn0w which we are using for this Tutorial. So every time your battery dies or you need to reboot your device please use redsn0w to do that. You will need to download Redsn0w 0.9.13dev 4, Your iOS 6 GM Firmware & WinSCP if you are on windows. Step 1: Install iOS 6 on your device. You’ll also need to know the location of the iOS 6 IPSW firmware file. If you’re on a Mac, you can find that in /Library/iTunes/iPhone Software Updates/ if you didn’t download iOS 6 manually, and updated using iTunes. You can also download iOS 6 from Below . After iOS 6 is installed, hook your device up to your computer, and place it into DFU mode. Step 2: Download RedSn0w 0.9.13dev4 from below. Step 3: Run RedSn0w, and click Extras > Select IPSW, then select your iOS 6 firmware file. It should successfully identify your firmware. Step 4: Click Back, and then click Jailbreak. You should see a dialogue box saying “preparing jailbreak data” followed by a page with several options. Ensure that Install SSH is selected, and click Next. Step 5: Your iPhone will now proceed through the jailbreak process. You will receive a message acknowledging that this is a tethered jailbreak. Step 6: Once the jailbreak is completed, and you are back on your Lock screen, place the device back info DFU mode. Step 7: Click Back, and then click Just boot. A pineapple logo should appear on your device, indicating a tethered boot. Once this complete’s and you are back on your Lock screen, you may close RedSn0w. Step 1: On your iOS device, go to Settings > Wi-Fi > and click the arrow next to your connected Wi-Fi router. Find your IP address for your Wi-Fi connection. In my example, my IP is 10.1.1.67. Step 2: On a computer connected to the same Wi-Fi network, open the Terminal app. Step 6: After a minute or so of scrolling prompts, your iOS device should reboot, and Cydia will be installed. If you get any permission errors on the terminal, just ignore them. That’s it. You now have a jailbroken iOS 6 device running Cydia. Please “Like” & “Favorite” the Post & Subscribe for so much more! Finally we have a FULLY Untethered Jailbreak for iOS 5.1.1! The Dev Team has released Absinthe Version 2.0.4 which is compatible with any iPhone 4S, 4, 3Gs, iPad 3rd, 2nd & 1st Gen as well as the iPod Touch 4th & 3rd Generation. 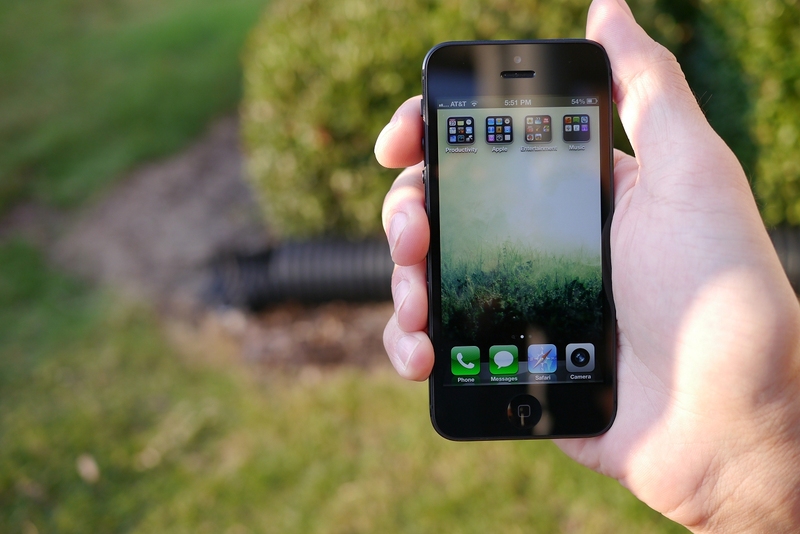 This Jailbreak is Extremely Easy & Fast and Error Free! Will work on Mac & Windows. Step 2: Extract the downloaded file, and right click the absinthe-win-2.0.exe icon and select the option Run as Administrator. This first file is a self-extracting *zip file. Once you finish this step, a new folder is will be created on your desktop called absinthe-win-2.0 that will contain all the necessary files for ios 5.1.1 untethered jailbreak. Step 3: Navigate to absinthe-win-2.0 folder, Right click on the absinthe.exe, And choose Run as Administrator. Step 4: Now Link your Untethered Jailbreak eligible iOS 5.1.1 device, and verify if Absinthe recognizes your supported iDevice. Step 5: When your device will be recognized, click on the jailbreak button on Absinthe v2.0. You should notice a progress bar appear on the absinthe interface. Step 6: Now your device will look as if it's performing the restore, this is absolutely normal process. Step 7: When the device has finished the "restore", you will see the Cydia icon in the Home screen display. Step 8: Once that Absinthe 2.0 reports the process has ended, you are free to close Absinthe and disconnect ypur untethered jailbroken device. Step 9: Finally, run Cydia and allow it manage itself. Now your device is jailbroken untethered running latest iOS 5.1.1 firmware! Step 2: On RedSn0w’s main window click Extras > Even more > DFU IPSW, and click OK on the pop-up dialogue. Step 3: Browse for a valid signable IPSW file from Apple. For instance, if you have an iPhone 4, you want to select the iOS 5.1.1 firmware, since that’s the only firmware that Apple is signing at the moment for this device (as of 7/5/2012). Step 4: Once you select the file, RedSn0w will go through the process of creating a new IPSW firmware file that will place your device into DFU mode upon restore. This firmware file will be placed in the same location as your original firmware file, and be named with the prefix ENTER_DFU. For instance, if I selected firmware for my iPod touch 4th generation for iOS 5.1.1, my original file should look like: this iPod4,1_5.1.1_9B206_Restore.ipsw, and my new file should look like this: ENTER_DFU_iPod4,1_5.1.1_9B206_Restore.ipsw. Step 5: Connect your device to your computer and open iTunes. Select your device in the iTunes sidebar, and hold the Option key (shift on Windows) and click the Restore button. Find your newly created ENTER_DFU IPSW file, and click OK. This will restore your device and place the device into DFU mode upon restore. You should just see a black screen once the restore is finished. Step 6: Your device is now in DFU mode, with a freshly restored IPSW. You can now jailbreak your device using our easy to follow RedSn0w tutorials. There was a time that Apple had the smartphone market to its self but times have changed and the fruit based company now finds it has a lot more competition especially from old foe Samsung. Arguably the two most wanted devices currently available are the iPhone 5 and Samsung Galaxy S3, as the iOS and Android devices are locked in a showdown for supremacy in the smartphone world. Meanwhile though many Android users would suggest the device doesn’t bring anything new to the market, but the question is which device is better to actually buy? The Samsung Galaxy S3 has some of the best hardware currently available, and will next month be updated to the Android Jelly Bean operating system. By now, many of you may have heard about Samsung’s new print ad. They have taken an aim on Apple’s latest handset. The print ad compares the specifications of both devices. As you can see on the top - it says ‘It doesn’t take a genius’. 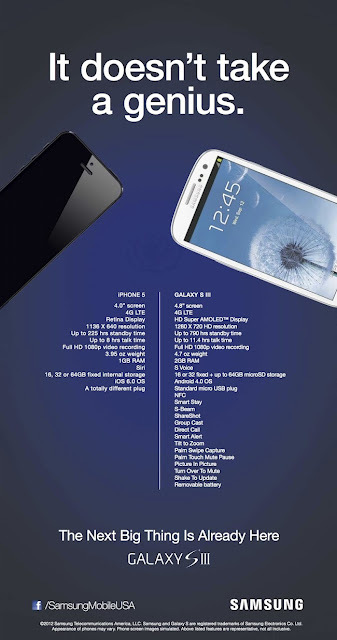 At the bottom, it’s written ‘The big thing is already here Galaxy S3’. This was a poor attempt in our regard to get media attention, as the iPhone 5 isn't even out in the market yet. Then there is the more expensive iPhone 5 that will be running the iOS 6 operating system, and is ideal for anyone that already owns an iPad or MacBook with its high level of integration. iOS 6 will bring with it 200 new features that include an upgraded Notification Center that will bring calendar invitations, messages, Facebook friend requests, and much more. Samsung’s 4.8-inch Super AMOLED is still the larger screen here, it sports Corning Gorilla Glass 2, a 1280x720 pixel resolution and a pixel density of 306 pixels-per-inch (ppi). Visuals are very crisp with excellent colour, contrast and brightness. There really isn’t anything to complain about. The iPhone 5’s screen size may have expanded from previous iPhone models but it’s still quite reserved in scale at 4-inches. Still, this is a nice size in terms of handling and usability and the moderate scale means Apple can squeeze a high 326 ppi pixel density out of its 1136x640 pixel resolution. As usual, it uses Apple’s IPS LCD Retina technology for some fantastic visual clarity and colour. Once again, there are no complaints, but in terms of raw pixel count the iPhone 5 has a clear advantage here. Apple has stuck to its habit of offering three flavours of storage capacity: 16GB, 32GB and 64GB, with a price that scales alongside. As with previous iDevices, there’s no sign of Micro SD capability. Samsung’s Galaxy S3 has the same options for 16GB, 32GB and 64GB, although the 64GB model is yet to surface on the UK market, Samsung itself has confirmed it will arrive at some point this year. However, the Galaxy S3 has the key advantage of storage expansion via Micro SD and Micro SDHC for cards up to 32GB and 64GB respectively. Samsung takes the winner’s podium for this round. The software will also make it easier for users to share content via Facebook and Twitter, and iCloud has added functionality. The Galaxy S3 still has the Ice Cream Sandwich operating system that is almost a year old now, so until it receives Android 4.1 it is arguably losing out to the iPhone 5. Apple’s A6 processor that is found in the iPhone 5 is 22% smaller than the unit found in the iPhone 4S, and has twice the computing and graphical power, and will use less energy than previous versions. The Galaxy S3 meanwhile uses Samsung’s Exynos processor that can outperform both the Tegra 3 and Snapdragon S4. More than is often the case, the battle between the iPhone 5 and Samsung Galaxy S3 is the very definition of the case between iOS and Android, between Apple and Google. The Samsung Galaxy S3 is more flexible, with expandable memory and a more malleable OS. However, the metal body of Apple's phone feels a lot more premium, and is a much friendlier design for those with less than giant hands. And with the larger 4in screen, it won't feel quite so tiny next to the Samsung Galaxy S3, either. Another year, another iPhone. 2012 brings the iPhone 5, with the usual long lines at Apple stores and lots of hype. 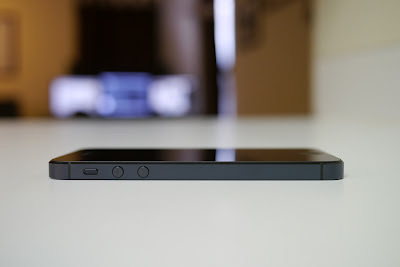 But this is actually a very solid upgrade: the iPhone 5 has a 4" Retina display and true 4G LTE. While the 3.5" display on prior iPhones seemed downright old fashioned in terms of screen real estate, the 4", 1136 x 640 display feels like there's room to spread out and read web pages without chronic zooming. The on-screen keyboard likewise is wider in landscape mode and easier to use. There's an extra row of apps on the home screen. Trust me, you'll notice the difference. And at 326ppi and 500 nits of brightness plus high contrast, it's one of the best displays on the smartphone market. Apple claims it has a 44% wider color gamut that covers the full sRGB spectrum (that's pretty impressive). The only caveat? Apps that haven't been updated to support the new resolution will have black bars at the top and bottom (we expect most popular apps will get updated quickly). Apple reps have referred to the phone as ‘the most beautiful ever made’ and it seems like consumers agree. The new phone features an anodised black panel and the rest of the phone is glass. Bloggers have been split on the issue of the new phone’s aesthetics. It’s also 20% lighter than the previous phone, which is quite an improvement. It also comes with a larger screen and widescreen capability. Marry this to the new much-trumpeted 4G data speeds and you have the perfect tool for streaming video on the go. All the indicators say that the iPhone is sure to be a success. We want to know if you’re one of those waiting to receive your shiny new device. Which plan are you going with, and which new features have persuaded you to upgrade from your previous phone? There's a dynamic low-light mode, a precision lens alignment, sapphire crystal which leads to better quality images at 8 megapixels. The resolution of the front camera has been increased to 720p HD. There's also a Panorama mode for capturing landscapes and the image is saved at a 28 megapixel resolution. The battery can give you 8 hours on LTE which is an improvement over the iPhone 4S. The small dock connector is USB 3 compatible and that makes it 10x faster than the USB 2 30-pin connector. The dock connector has been named Lightning. It is 80% smaller than the previous connector and has an adaptive interface, is more durable and can be plugged into any orientation. Having 4G LTE on the iPhone 5 means that the users will be able to see improvements when streaming HD videos or high quality audio streams. The 4G LTE supports speeds up to a 100Mbps. The Wi-Fi supports two bands which are the 2.4GHz and the 5GHz. A dock connector convertor is being presented for the iPhone by the name 'Lightning to 30-pin Adapter'. This allows users to use old accessories with the new hardware. All of the older accessories are compatible with the new device, except for the cases and sleeves. 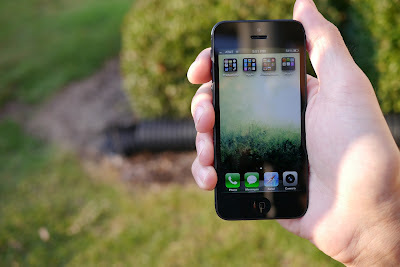 iPhone 5 come up with iOS 6, read more about iOS 6 features. There's a new type of SIM card featured in the iPhone 5 which has been called by many as Nano-SIM. This new SIM card needs to be obtained from the network carrier in order for the iPhone 5 to work properly. - Do Not Disturb: turn off all those annoying reminders to play Words with Friends when you want to sleep. Don't worry, your wakeup alarm will still sound. You can schedule DND, so you don't have to remember to enable and disable it every morning and evening. And yes, Apple's maps can be quirky, though it hasn't guided us to Uganda yet for Mexican food. Mostly we've noticed POIs oddities when zooming: with no rhyme or reason POIs disappear when zooming and returning to an old zoom level, but that doesn't bring back suddenly missing POIs. And some landmarks like the Eiffel Tower look foreshortened or squashed. But keep in mind that Google Maps had us going in endless circles around our big box store destinations and told us to drive into a creek when it first came out 5 years ago. Nokia Maps in the US were even more likely to send us two countries away for dinner. I suspect that Apple will hone Maps soon enough, and since all data comes from their servers, they can iterate it quickly and easily. But until then, rely on your carrier-bundled navigation solution (often powered by Telenav) or third party offerings for mission critical destinations. The 16GB model is priced at $199, the 32GB is $299 and the 64GB is $399. There's also a two year contract from Verizon, AT&T or Sprint. The device is available in two colors which are black and white. You have probably used cloud computing and probably didn’t even know it mainly becauseyou did not even know what cloud computing is. Quite simple, cloud computing is where the internet (such as Charter internet) is used to provide services that are actually software. Regardless, Cloud computing can help you and your business save benefit substantiallyfrom it. Services such as Hotmail or even Gmail fall under cloud computing. Including cloudcomputing in a business has allowed companies to access virtual resources that scale with them to deliver real-time solutions. Different and well equipped servers are used to store any applications, data and upgrades that the company uses. Most companies use various programs to manage the needs of their business. This does not save time because you need to spend a lot of time optimizing the programs and get them working right. Cloud computing allows you to avoid all these problems altogether andsaves you time. As all businesses know, when one person saves time, the company saves time – time is money. Applications that use cloud computing need fewer versions. Very little upgrades are needed because of its effectiveness. Additionally, the upgrades are usually managed by the data centers that house them. Many businesses face problems because software does not work properly or there are many glitches that need to be fixed. The downtime can be problematic especially when the software forms part of the core of thebusiness. Cloud computing lets more applications be integrated within the same solution, with less glitches than separate programs. This improves productivity of your employeesand is hence more profitable to the company. This may seem like a futuristic idea but it is true. Clod computing enables your business to use more power. In most cases, you cannot use this power because normal computers do not possess it. This power is actually virtual processing power. You can even use virtual assistants (they function exactly like normal assistants) that saveyou money and time. This also saves your business money by reducing employment costs. One of the biggest advantages of cloud computing is the mobilization it entails. If you were overseas on a business trip, you won’t be able to use the specialized programs they youwould have been able to use in the office. Cloud computing overcomes this problem andallows you to use the internet (such as Charter internet) to access the tools normally found in the office. Your employees can even access the tools he/she may use in the office at home or on the way to work. This increases productivity and is drastically enhances employee efficiencyand hence benefits your business. More and more people are using the internet every day. Statistics show that around 69% of Americans use a form of cloud computing. Whether using email, software or storing data,cloud computing allows you to keep up with the latest trends. Many companies usually buy the latest programs in hopes that sales will significantly improve. It must be remembered that these are stock programs that have been tailored to work for every type of company. In most cases, a personal touch is required. Cloud computing does just that. You can build interfaces to be more user-friendly andprograms to do exactly what you want them to. This will help your business stand out andwork more effectively. This saves costs in both the short and long run. It also enables youremployees to get more done with very little effort – improved productivity due to customization. Times change and you can require more power to run new software. You may need more space to hold data. Cloud computing reduces the need to upgrade computers. Most of the resources are stored on the server and hence hardware seldom fails and does not need to be replaces as often. You can look at cloud computing from any angle and you will still see a benefit; for bothyou and your business. ABOUT AUTHOR: Olivia Kane is associated with Charter internet related companies as their freelance and staff writer. She has been linked with some of the best web media companies and offers various ways for internet solutions. She excels in writing articles related to Xfinity internet deals, Comcast deals, Verizon internet, Xfinity cable etc.